As a mother of four children, one of the things I struggle with the most is keeping my kids reading through the summer months. For some reason they seem to think once school is out, they can turn of their brains and veg out on the couch in front of the TV all day! We have a dedicated “reading time” where all they can do is read, but sometimes they still gripe and moan when it is time to choose a book. An additional challenge is that my oldest 3 are independent readers, but my 4 year old still needs someone to read to him. 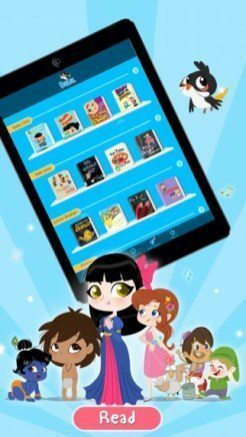 I am hoping that BulBul – Free Kids Apps will help me out! This app is a collection of stories, both classics and contemporary, that children will love! This app is a free download and it comes with several books that you can download for free as well. There are easy, beginner stories for younger children, fairy tales, folk tales, princess stories, just about anything your child could want. 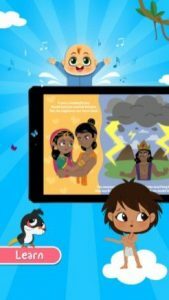 According to the developer, they are “continuously adding stories to the library so you will always find something new.” I read 3 stories for this review: Bath Time, The Three Little Pigs, and The Birth of Krishna. Bath Time is a delightful story about a baby’s first bath. The illustrations are bright and colorful and bold. The story line is perfect for babies, toddlers and young preschoolers. Each page has sound effects and fun interactive elements that are brought to life before their eyes with the tap of a finger. Your child will love watching the chubby, pig-tailed baby as she conquers her fear of bathtime. The Three Little Pigs is a hilarious re-telling of the classic tale. This book stays true to its origins while adding in a few new elements to keep it fresh. The illustrations are silly and goofy and my kids giggled at every page from the silly actions and sound effects from the interactive pages. This is a story your children will come back to again and again. Finally, The Birth of Krishna is a story from Indian Mythology. It is about an evil king who sentences a man and his wife to death unless they promise to give him all of the children born to them. However, one day something miraculous happens and the man is able to sneak out of prison and get his newborn son to safety. A goddess visits the evil king with an ominous prophesy about the baby and how he will be his downfall. This story is very interesting, but is a bit dark for young children. I would recommend this title for children 8 and up. I really enjoyed all three of these stories and I am confident that I will find the other stories in the library equally enjoyable. I love the idea of having such fun books in a virtual library that my kids can access during reading time to add variety to their choices. I also love that these books can be narrated for my 4 year old so that he can read along “independently” with his brother and sisters. I can’t wait to experience more of these books with my children!